i recently adopted a gsd. he's been abused and seems a little skitteish he's good with kids and doesn't seem so good with my cats. incredibly stubborn with leash training. i got him because my husband is gone on deployment. he's already lightened up and started wagging his tail and sliming my hand. i know about how to feed as far as an alpha standpoint. could you give me some pointers to put him at ease with my cats ?? Unfortunately this is one of those things that will take a good amount of time. And training. For both your new German Shepherd family member - and the cats. First of all patience - you will probably need plenty of this, and depending on how skittish your cats are around the dog, that will cause a problem too - especially if they tend to run which will make the puppy want to chase - whether it originally intended to or not. Good for you on rescuing the German Shepherd puppy though, treat him well, be patient and with time he will make you a good pet but if I were you I can't suggest it enough that you both take a dog training class together - it'll be the best money and time you ever spent on helping you to bond with him. Not to mention all the socialization aspects. I would suggest the training class to help you both but also to help you gain more control of him especially where the cats are concerned. This would be my first suggestion - after that, ask your trainer for more suggestions about the whole dog cat issue since I am not a dog trainer by no means. But good luck with your new baby. Comments for Got any gsd - cat pointers? We have a shepherd rescue dog about 8 years old---and he is very protective of us --my daughter moved away to grad school and couldn't take her cat---so we have him---and he and our dog are best buds! !We had to separate them via gates for awhile---they could see each other but Chief our dog could not get to the cat---until one day the cat just hopped the gate and made himself at home with the dog---and they are fine!Then when she moved back home for her internship---with her new kitty---we did the same thing--only kept new kitty away from "big" kitty and and "big" dog---until new kitty just hopped the gate and now all three are buds---its too funny!Our dog has new buddies to run and play with---it gets pretty chaotic at times but hysterical to watch!So the key is to introduce gradually--let them get used to each other first without interacting! Didn't mention his name. He is absolutely Beautiful!!! He is a "pretty boy" in spanish "Prima Chulo", Chulo for short. Love his big ears, big feet amd his black muzzle. Just have patience and with lots of love he will come around and be your Protector, it's in their blood. 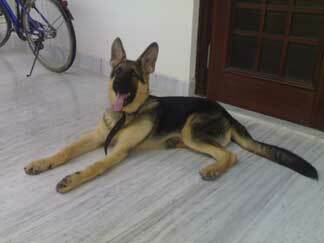 You can read our heartwarming stories, "GSD puppy Mia's Story" and undated "Mia My Beautiful German Shepherd Dog". Take care of him and he will take care of you, he may even get to like the cats. God Bless you and your "Chulo"!! !